Only one Masters winner has shot over par on Thursday in the last 20 years. 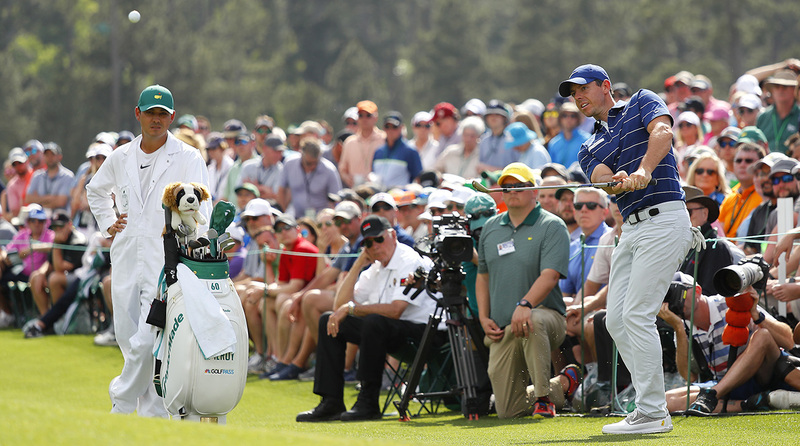 Rory McIlroy's opening 73 puts him in a precarious position as he chases a career Grand Slam. AUGUSTA, Ga. — There were Rory McIlroy moments: drives that carried-uncarriable bunkers, approaches that never left the flag and mid-irons into par 5s. The problem was, there were just as many fanned tee shots, unforced errors from the middle of the fairway and missed five-footers. McIlroy made five birdies in his opening round of the Masters on Thursday, but he also made six bogeys as he started his latest bid for golfing immortality. He was disappointed with his one-over 73, particularly after missing two putts inside eight feet to finish bogey-bogey, and eager to wrap up the chit-chat so he could get back to the lab. “I’m going to the putting green now to try to figure this out,” McIlroy said. “Reads more than anything else. I over-read a few early on, and then I started under-reading them coming in. So I have to just try and work on that." This was the first time McIlroy shot over par on Thursday at the Masters since 2010, when he was 20 years old, and it’s the highest-opening round he’s shot on the PGA Tour this season. If this is going to be the week the player formerly known as "Boy Wonder" becomes just the sixth man to win the career Grand Slam—as many people believed it would be—he’ll have to buck a recent trend: the Masters winner has shot over par on Thursday just one time in the last 20 years. McIlroy has been answering questions about the career Grand Slam since he won the third leg in 2014, but there was (if possible) even more CGS talk this week. He has himself, and his recent play, to thank for that. McIlroy hasn’t finished outside the top 10 in any of his seven tournaments this year, and he’s placed no worse than T6 in a stroke-play event. That includes his win over the strongest field in golf at last week’s Players Championship, a statement performance that established himself as the unquestioned man to beat—and Vegas favorite—at Augusta. He said all the right things in his pre-tournament interviews. The game feels good. The body feels good. The mind feels good. But his first tee shot on Thursday was a reminder that the golf ball doesn’t care whether the guy who hit it has seven straight top 10s or seven straight missed cuts. McIlroy hit a foul ball right of right, punched out to the left side of the fairway and couldn’t get up-and-down for par. An opening bogey set the tone. Thursday was a struggle. To his credit, he fought the whole way. McIlroy found himself two over after missing a makeable birdie putt on the par-3 12th. Then, when he needed it most, he hit one of those drives on 13 that makes you realize why he could finish his career as one of the best players of all time. A towering arrow that sliced through the Georgia air, trivialized the fairway’s subtleties and landed 327 yards away from where it took off. A mid-iron to the middle of the green, two putts and he was trending the right way. The most impressive shot of the day came at the other feastable par-5 on the back nine. After a pulled drive behind the trees on the left, McIlroy faced a downhill, 203-yard approach to a perched green with water short and long. No problem—a 7-iron under one branch, over another, to the back edge for yet another two-putt birdie. He parlayed that momentum to 16, the site of virtually his only bright spot on the putting greens all day. He left the flagstick in—always an odd sight, but particularly so at this sporting cathedral—and drained a 35-footer to get to one under. Then came the back-to-back bogeys, the last swoop on a roller coaster of a day. “I’ve sort of been through it all on this golf course,” he said. Yes, compared to his tortured history here—a 43 on the back nine to blow it in ’11, a listless Sunday 74 from the final group last year—this was, as he said with a smile, “a bit of a dawdle.” Tough to excite, this man. After all, he is gunning for glory. And 73s don’t lead to glory.